Dear Reader, I present to you eighteenth in a infinite number of posts of "The Weekly Source Code." Here's some source I was reading - and writing - this week at Mix. I have been checking out Deep Zoom in Silverlight 2, but I thought it was a bummer that there wasn't (yet) a "Hello DeepZoom World!" example that includes panning, zooming (mouse wheel) support out of the box. The Vertigo example behaves exactly as I'd want my stuff to behave. You can see my working Deep Zoom example here or by clicking the picture at right. Adding Mouse Wheel support to Silverlight can happen a couple of ways. Mouse Wheel events are sourced by the browser, not by Silverlight itself (which is the way you'd want it as Silverlight lives inside the browser, it shouldn't replace its behaviors, IMHO). I took this along with snippets from Yasser Makram and John posting in Yasser's blog's comments got me mostly what I needed. I've seen some basic examples using either mouse clicking or key-downs to get the zooming effect, but I wanted to support mouse wheel events as well, just like the stuff shown off at Mix. RANDOM NOTE: Here's a cool switch you can set on MultiScaleImage. It's UseSprings="false" and it'll turn off the zooming animation. Why would you want to do this? Well, that very zoom-in/zoom-out animation gives DeepZoom an opportunity to perform its "visual slight of hand" and transition between images. When the animation happens, you are less likely to notice the transition between tiles (a good thing). Of course, I want to get my head around how it all works so I liked seeing the transitions. Keep in mind it's four in the morning, so this code is a little wonky and not at all thought-out and I've only been at it for an hour. I'm REALLY interested in what you, Dear Reader, can do with it and make it better so we all have a canonical example to start from. This is NOT that example, I'm actually kind of reticent to post it here because it's so hacked together, but that's half the fun, right? It works OK, I think. One thing to point out, note that the name of the control is "msi," set in the XAML above via x:name="msi" so you'll see me referencing properties like msi.thisandthat in the managed XAML code-behind below. Also, the "using akadia" below is Pete's MouseHandler code's namespace referenced from my page. My code hooks up a bunch of events from the constructor using anonymous delegates, and those work together to call a single Zoom() helper method. One, if you scroll WHILE the "spring zoom" animation is happening, something goes wrong and you'll continue zooming in, no matter what direction you're scrolling. Second, more subtlety, if you scroll in, stop, then start scrolling out, it'll scroll in a step, then start scrolling out, so there's clearly a state issue I'm goofing up. Stated another way, if a managed event comes in WHILE the animation is happening, the direction it's currently zooming just keeps going. (Maybe a subtle bug, or my code needs to be debounced because it seems like the mouse wheel events are coming in too fast.) In my example, you have to let the animation "settle down" in order to zoom the other way. Of course, if you just F5 to Refresh you can get back to home and reset the zoom. I figured it out, I was using a relative calculated ZoomFactor when I should have used an absolute factor. Third, I want to prevent the image from panning outside the viewable area (meaning, I don't want folks to get lost) and I'd like to stop the zooming in and out at some reasonable max/min. Don't forget to setup .xap files as the mime type application/x-silverlight-app on on your hoster's IIS instance. Very cool and fairly easy considering all that's going on. I'll look into other ways this can be exploited in the morning. "I'll look into other ways this can be exploited in the morning." Peter's idea to utilise the HtmlBridge is so simple and so brilliant - why didn't I think of that! Thanks for finding it and sharing. Here's the working DeepZoom example running on my blog here. It's bandwidth heavy, so I may have to remove it one day. You can also click on the image above. Thanks Scott. I have updated our Expression Blog post to include a pointer to this. Hey Scott.. how did you get the Background of the MultiScaleImage control to be transparent.. or inherited from the parent container? Mine has a white background and it's not inheriting from Grid. I was playing around today and figured out how to stop zooming at a specific depth. I've updated your Zoom method below to show how I did it. You seem to be adding two event handlers to MouseMove. Its really awesome to see the community figuring this one out while we wait for some offical samples! Next on the list is the filtering and dynamic resorting - anyone? Here is another proof of concept DeepZoom demo, using images from the static google maps api. It's really pretty simple to put these things together with the new mix08 toolset. Scott, Thanks for the article. The part I can't figure out is how to relate the mouse pointer in the msi control to the individual source image it's located in. If you post an answer please email me the link. Thanks again. 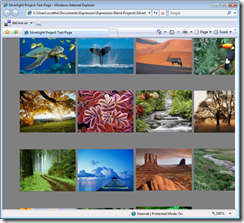 Can I make a WPF Windows application using Deep Zoom? Please comment. Tnx, nice article! One question: Can a DeepZoom app be hosted in IIS6 or even just by clicking F5 or must it be hosted in ISS7? I have tried various examples to run them on my XP machine with no luck? I have VS2008 + IIS6? Any sugestions? Hi, on my site http://www.xamltemplates.net doesn't promote something like this to show the users how easy is to stylize the controls, without buyn other extras. The expression team blog has added some sample code to show repositioning of sub images. I disagree about whether the browser should handle mousewheel events. Why not put an option in Silverlight to say - Hey I'd like Silverlight to handle Mousewheel events instead of trying to do this with paperclips and chewing gum? Rudi - Yes, as long as the MIME/TYPE is set correctly for Silverlight! Dave - That philosophy isn't a Silverlight-ism, but rather a "rule" for browser plugins to make sure their behavior is consistant. It is hammering that CPU and RAM so hard it is incredible. Can anyone seriously expect to run this bloat anywhere? For a remotely serious app? The beta excuse. :) Seriously, how hard is it to insert a time.sleep(0.1) or somesuch? Excellent code. I do want to mention a bug I came across. The mouse positioning only works if the multiscaleimage and the root element are positioned together. You need to call GetPosition on the same element to make it work regardless of the relationship of the MSI and the root elements positions. A minor nit but it bit me on my project. I changed them both to "GetPosition(this.msi)" and it works just fine.